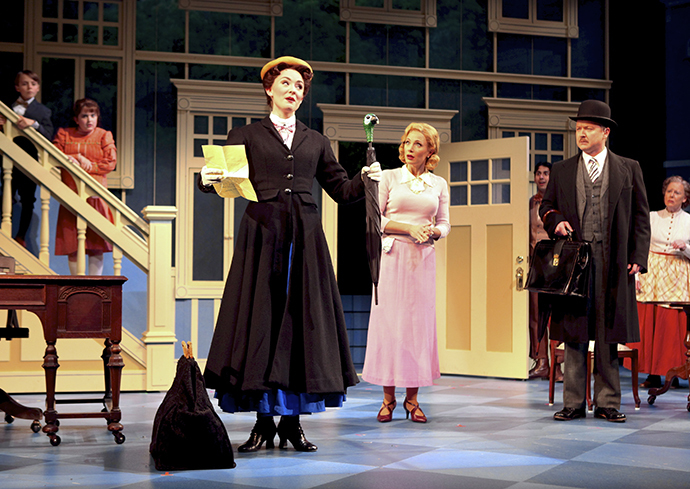 Nanny Mary Poppins arrives in the Banks household in the musical running through Jan. 8 at Syracuse Stage (Photo by Michael Davis). “The song sticks to you like gum to the bottom of your shoe,” Amster says. More than a half-century later, the 34-letter word is part of the jubilant foundation of “Mary Poppins,” an Amster-directed musical that draws upon the music of the Disney film of the same name. That production has almost sold out its six-week run at Syracuse Stage, according to Communications Director Joseph Whelan. The cast is an ensemble of professional actors and Syracuse University students, a youthful presence that in this case is especially fitting. It turns out the first established use of the word “supercalifragilisticexpialidocious”—or at least a word that comes extremely close—was not in London, by a mysterious nanny or a chimney sweep. It came from Helen Herman, a student at Syracuse University in 1931. She was a student writer. She used a version of the word in a sketch for the Daily Orange, where she wrote that she created it herself. To the best knowledge of legal and linguistic experts, it is the first time the word appeared anywhere in print. The credit, he says, goes to Herman. “What I came to love about it,” Amster says, “was its playfulness.” He says he approaches the song as “Sesame Street on steroids” at Syracuse Stage, a professional theater-in-residence at the University. And he has a simple reaction to the idea that a fabled word at the heart of “Mary Poppins” was used officially, for the first time, on this campus. “Way cool,” Amster writes in an email. If most people hear the song, smile and move on, “supercal”—and its origins—remain part of an ongoing quest for Zimmer. His passion is the genesis of words. He was curious about the provenance of “supercal,” and questions raised by his research only stoked his curiosity. Several years ago, Zimmer spoke with Richard Sherman, now 88. Sherman co-wrote the song with his brother Robert, whose death in 2012 rekindled Zimmer’s sense that it was time to nail down the history. Richard says he and his brother heard the word for the first time in the 1930s, as children attending a camp in Pennsylvania. Yet songwriters Barney Young and Gloria Parker sued Disney in 1965, contending they invented the word when they used a similar version in their own songs in 1949 and 1951. They lost the case. The court essentially upheld the argument of the Sherman brothers. “It’s an American tradition to graft together different versions of many words to get longer, funny-sounding words,” says Zimmer, who believes variations of “supercal” may have floated up and down the East Coast. Three years ago, Zimmer told the Syracuse Post-Standard about a key discovery. An archivist with the Merriam-Webster dictionary supplied him with a file on the background of “supercal,” a word that has yet to find its way into the pages of that dictionary. The file included a clipping supplied in 1965 by Harvey Fortier, a Disney librarian. 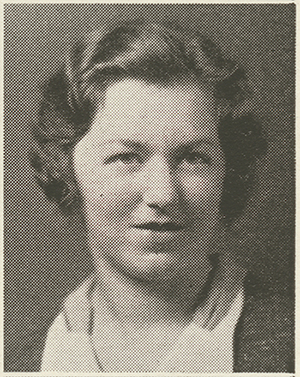 It was the 1931 piece written in Syracuse by Helen Herman, for a Daily Orange column called “A-muse-ings.” In the column, she offered a whimsical reflection about the small number of male writers at the paper. There it is. Her version was slightly different than the one used in the movie. But for the purposes of Disney, trying to prove that “supercal” had been around long before 1949, it was close enough. Zimmer wrote a piece about that discovery for the Boston Globe. It was spotted by Beth Hanson-Galvin, whose husband Ed, now retired, was then director of archives and record management for Syracuse University. The column offered a resolution to a long search on the top floor at Bird Library. Both Galvin and Mary O’Brien, a reference assistant in archives and records management, say they’d heard rumors for years that “supercal” originated at Syracuse. The stories were so persistent they’d sometimes page through old University publications, in fruitless search of it. Zimmer remains intrigued by the tale. He’d love to know more about Helen Herman Lawkins and her life. In a 2014 piece for Vocabulary.com, “The Joy of Making Up Long Words,” Zimmer noted how the notion of meshing together long and silly-sounding words—such as “supergobosnoptious”—is an American tradition. He’s also the kind of guy who enjoys dropping in to see his friends in the archives at Merriam-Webster, which has yet to to officially add “supercal” to its dictionary. Not long ago, on one of those stops, archivists pulled the file on “supercal.” It included correspondence between Fortier, the Disney librarian, and Philip Babcock Gove, a legendary editor with Merriam-Webster. 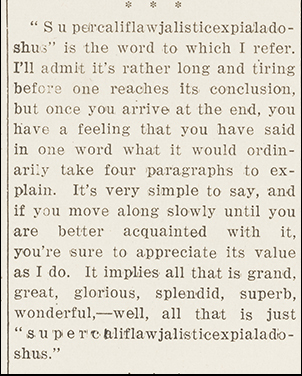 Herman wrote in 1931 that she invented the word, and no one has brought forth any evidence to challenge her claim. In that sense, then, “Mary Poppins” is bringing one of the most beloved words in American theater back to Syracuse, the place where it began.